Each Fall and Spring, Sienna Ranch opens its doors for special family and community open house days. Come enjoy our lovable animals, fun activities, good company, and wholesome environment. Bring your own picnic lunch or pre-order a healthy lunch to eat on the day. Family Day Passes are $85, when purchased in advance, or $105 on the day. Same day sales are available on a space available basis- no guarantees as our Family Days often sell out! Sienna Ranch is an outdoor facility with some rough, unsealed surfaces. Please contact us to discuss any mobility limitations before purchasing your Family Day Pass. Curious to know our plan for inclement weather? 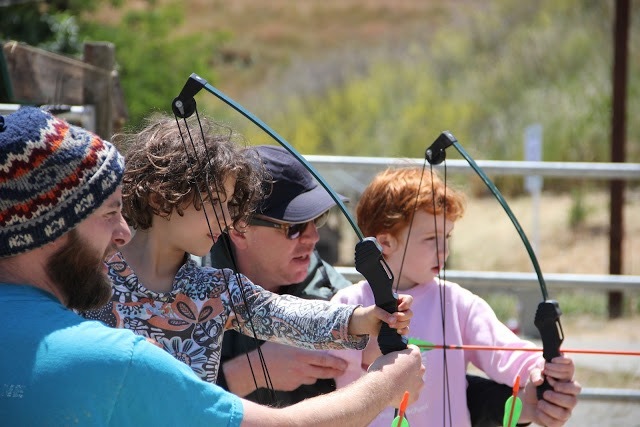 Read over our Weekend Weather page to get answers to frequently asked questions about how we safely deliver camp outs, field trips, birthday parties and more with precipitation in the forecast. Wear ranch-friendly clothes and dress for the weather. Thanks for wearing close-toed shoes! Registration is limited to 30 families per Family Day. If your chosen Family Day is full, you may add your name to our wait list through the registration system. This is not a guarantee of a spot, but if a space opens up we will contact you. 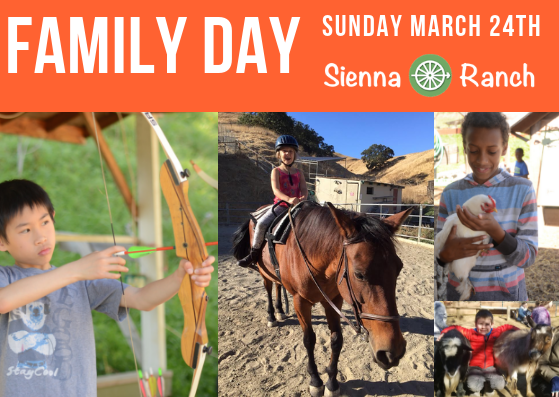 If Sienna Ranch cancels a Family Day due to rain, your Family Day registration will be transferred to a future date of your choice provided there is space. If your plans change and you are unable to attend Family Day, you can either request to transfer to a future date free of charge or request a refund (a $10 administrative fee will apply to refund requests). Transfer and refund requests must be made in writing at least one week in advance. Email refund requests to admin@siennaranch.net. Read our Weekend Weather Policy here. Healthy lunches are available for an extra cost of $10/person. Lunches are catered by Rising Loafer Bakery, in Lafayette, CA. Lunch includes sandwich, salad, cookie, and drink. Sandwich choices include vegetarian, turkey, tuna salad, roast beef, or chicken salad. Healthy Lunches must be ordered in advance.